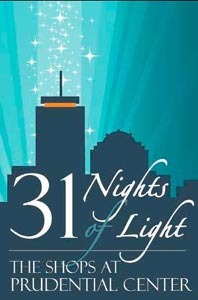 It's the 10th anniversary of 31 Nights of Light when for each night of December, the top of Prudential Tower is lit a different color in support of that night's charity partner. 31 Nights of Light was created to help community organizations gain key visibility during the holiday season. Each night, the top of Prudential Tower is lit a different color in support of that night's partner. Participating groups will 'flip the switch' each night, with a host of musical performances and speakers each night. Each organization will have one night in December to light the top of the Prudential Tower. Remember to look UP every night!